By public transport from Zurich Main Station, it can take as little as an hour and a half to find yourself atop of Mount Rigi, gazing out at the breathtaking views before you. 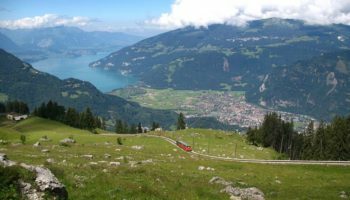 Trains run regularly to Arth-Goldau, and from here, you take a 40-minute cogwheel train to the top, where you’ll find lots of lovely hiking trails. It is even quicker to drive there; from Zurich, it usually takes just under an hour, depending on whether you head to Vitznau, Krabel, Kussnacht, Goldau or Weggis – various gateways to the mountain where you’ll find parking and cable cars or cogwheel trains to the summit. From Zurich, Kussnacht is the nearest. All you need to do is head south out of the city on the A4, then continue on the E41 past the Zugersee to Kussnacht. Here, you follow a winding road up the mountainside to the Seebodenalp aerial cable car, which will take you the rest of the way up Mount Rigi. Alternatively, you can carry on the same road past Kussnacht and head to the aerial cable cars at either Weggis or Vitznau. 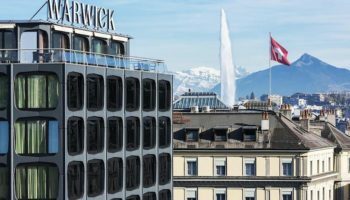 If you’re a bit pressed for time and want to see as much of Switzerland as possible in just one day, another option is to take a guided tour that not only takes you to the summit of Mount Rigi but also around the center of nearby Lucerne. 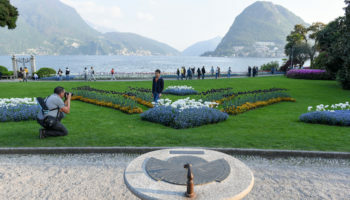 With a delightful cruise on Lake Lucerne and a lovely cable car and cogwheel train ride up the mountain included, it is a great day out, and the scenery is absolutely stunning everywhere you go. See trip reviews & prices. Lying just to the north of Zurich, the spectacular Rhine Falls are easily reached by public transport from the city, and the journey usually takes around an hour. 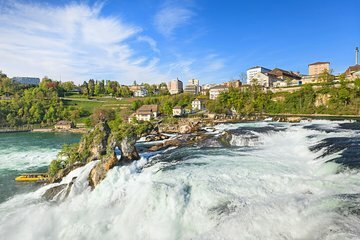 Just hop on a train at Zurich Main Station and alight at Neuhausen Rheinfall, from where you can simply walk to the falls or take a boat ride below them. Driving yourself is another option; this means you can explore the surrounding countryside at your leisure, with Saint Gallen in Switzerland and Konstanz in Germany not too far away. Just head north out of Zurich on the A1. Once you come to the A4, turn onto it and follow it all the way to the Rhine Falls. All in all, it should take about 45 minutes to get there. If you really want to make the most of your time in this wonderful part of the country, you may want to consider a guided tour. These not only take you to visit the falls but also to see the medieval Laufen Castle, the 16th-century Munot Fortress, and past the beautiful vineyards and quaint villages that characterize this part of Switzerland. See trip reviews & prices. To get to Mount Pilatus from Zurich, you first want to take a 50-minute train ride to Lucerne, then hop on a bus to the nearby Kriens, which is the gateway to Mount Pilatus. It is then a short walk to the valley, where you’ll find a series of gondolas and cable cars to whisk you up to the summit as you enjoy incredible views of the mountains. Alternatively, you can take a 20-minute train journey from Lucerne to Alpnachstad, where you’ll find the world’s steepest cog railway to take you to the top of Mount Pilatus. To drive to the towering mountain takes around 45 minutes. You’ll have to park at either Kriens or Alpnachstad and take a gondola or cog railway the rest of the way. Head south out of Zurich and pick up the A4 then A14 heading to Lucerne. This eventually turns into the A2 just outside of the city; you want to keep on it until exit 27 for Kriens, or exit 37 from the A8 for Alpnachstad. A popular option amongst many people is to take a guided tour to the top of Mount Pilatus. 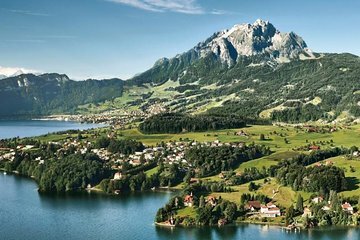 With an expert guide accompanying you, you’ll hike along the beautiful Dragon’s Path, take a cruise on Lake Lucerne, and enjoy incredible views from both the summit of the mountain and the cable car that takes you to the top. See trip reviews & prices. As regular trains run between Zurich Main Station and Lucerne, it is straightforward to get from one to the other, and the journey only takes 50 minutes. Once you alight, you’ll find all the city’s amazing sights just a short walk away, as is the glistening lake. A lovely way to visit Lucerne and enjoy the spectacular Alpine scenery that lies around it is to take a guided tour that includes a trip to the top of Mount Rigi. With a scenic paddle-boat ride on the lake and a delightful cable car ride up the mountain included as part of the package, the views on offer of the scenery are bewitchingly beautiful. In addition to this, free time in Lucerne’s lovely Old Town gives you the opportunity to explore the city at your leisure. See trip reviews & prices. While it does take around four to four and a half hours and a number of different trains to get to Jungfraujoch, the journey will pass by in no time at all, as you pass through the spectacular Swiss Alps. From Zurich, hop on a train to Bern, then take another one to Interlaken. Here, you need to take a Bernese Oberland railway to Lauterbrunnen, where you then board another train heading to Kleine Scheidegg. From here, the final stretch of the journey is on the Jungfrau railway to Jungfraujoch, where you can finally enjoy the incredible views. If all those changes sound like a bit of a nightmare, you might want to opt for a guided tour, as a scenic bus journey cuts out the first stretch of the trip and takes you directly to Lauterbrunnen. 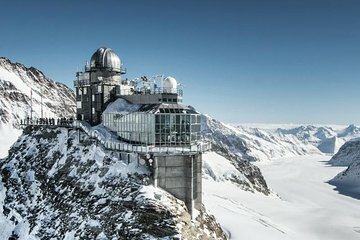 From here, carry on by train; the views of the mountains are staggering, with the panoramas from the summit of Jungfraujoch the highlight of the tour. With a trip to the Sphinx Observatory included, it is a great, stress-free day out that avoids all the hassle of getting there by public transport. See trip reviews & prices. The tiny country of Liechtenstein is a bucket-list destination for many travelers. Ruled by a constitutional monarchy, land-locked Liechtenstein is the sixth-smallest country in Europe, but it’s big on natural attractions. Those on a day trip from Zurich are likely to be more impressed by the beauty of the surrounding countryside than by the capital city Vaduz, although the boldly designed contemporary art museum is well worth a visit. The royal family’s castle in Vaduz is off limits to visitors most of the year, but the pretty hilltop Gutenberg Castle in the village of Balzers is open for exploration. To get to Liechtenstein’s capital of Vaduz by public transport is relatively simple, and generally takes around an hour and 40 minutes. Just hop on a train from Zurich Main Station and alight at Sargans, which lies on the border with Liechtenstein. 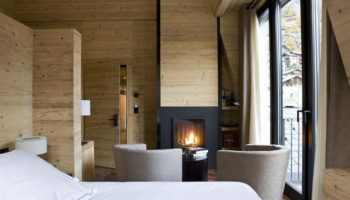 From here, take the number eleven bus to Vaduz – or indeed, any other little town that takes your fancy, as the bus runs the whole length of the country. While it is easy enough to get to Liechtenstein by public transport, you are probably better off driving there, as this enables you to explore the fantastic scenery and charming little villages at your leisure. From Zurich, head southeast on the A3; this will take you almost all the way there, as you only turn off at exit 9 when you see signs pointing you to Vaduz and Liechtenstein. The journey takes just over an hour. On the way, you pass gorgeous lakes and towering mountains. 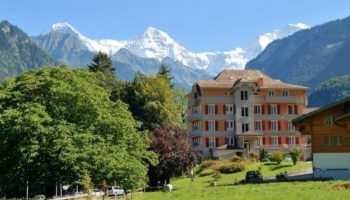 Another option for visiting Liechtenstein is to join a guided tour, that not only takes you to the Principality’s charming capital, but also Heidiland in Switzerland. With a knowledgeable guide on hand, you’ll learn all there is to know about Vaduz. The nature and scenery at Heidiland is astounding. 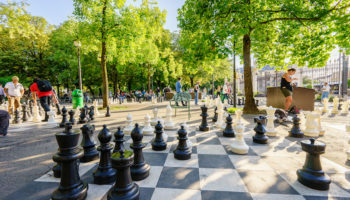 As this tour also includes a sightseeing trip around Zurich, it offers the perfect combination of history, culture, and nature, with something for everyone to enjoy. See trip reviews & prices. 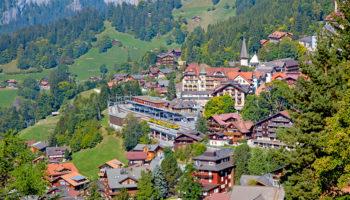 While it does take a couple of hours to reach Engelberg – the starting point of your ascent to the top of Mount Titlis – from Zurich, the scenery from the train window is so stunning that the journey will fly by in no time. From Zurich Main Station, you first need to take a train to Lucerne, where you then change platforms and take another train to Engelberg. From here, your ascent really begins. 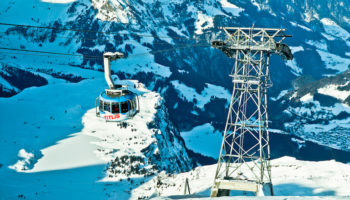 You then need to take a series of cable cars up the mountain to the top of Mount Titlis. All in all, the whole journey from Zurich to the summit should take two and a half to three hours. Driving to Mount Titlis is another option, although be prepared to drive along some very narrow winding mountain roads. From Zurich, head south out of the city center and pick up the A4, which will take you to Lucerne. Here, continue on the A2 until just before Oberdorf, when you should take exit 33 and turn off onto the scenic mountain road that will take you to Engelberg. After having enjoyed the hour and 20-minute beautiful drive, park up and hop on a cable car to the summit. If small mountain roads aren’t your thing, you may find it simpler to take a guided tour to Mount Titlis. 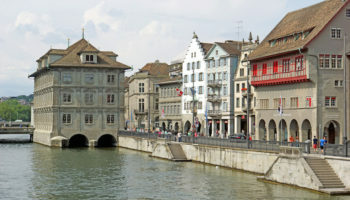 As well as taking you up the mountain to bask in the stupendous views, the tour also takes you skiing, for a walk over Europe’s highest suspension bridge, and to Lucerne, where you get to explore the city’s fantastic Old Town. See trip reviews & prices.